To overcome one of the main criticisms addressed at biofuel technologies, which is that they compete with food production, research is directed at using low-grade biomass resources, which are not used directly for human consumption. This includes resources such as food waste, sewage sludge, food industry co-products, agricultural residues and fodder grasses. Work includes an audit of the biomass resources in Wales and in the rest of the UK to identify the quantity and geographical location of biomass and identify if these diverse range of substrates can be brought to together to develop a year round and sustainable supply chain for biohydrogen and biomethane production. 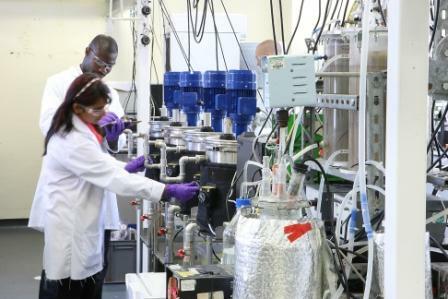 The yield of biohydrogen and methane is also being optimised for the range of biomass substrates identified available in Wales and the rest of the UK. A number of strategies to increase the overall system efficiency are being investigated. A platform of laboratory based and pilot scale systems for the production of biohydrogen and biomethane are being utilised to evaluate these strategies. Activities include the investigation of number of pre-treatments, reactor designs, reactor operating procedures, process monitoring and control systems to increase substrate bioavailability by improving the degree of hydrolysis and optimising the microbial communities and their underlying metabolisms in a two-stage biohydrogen and biomethane fermentation system. The aim of this work is to develop systems which have significantly increased loading rates and gas yields, with potential efficiency increases of more than 200% over conventional CSTR systems. Improving system economics through the alternative exploitation of volatile fatty acid intermediates and anaerobic digestate resources is also being investigated.